We are here, it is amazing, and I feel fine. So glad I did not turn tail and come home. Got in around 4 pm yesterday. It is WARM here. Nice after chilly Paris. Our hotel, the Dan Panorama, is on the sea, which is the only nice thing I can say about it. This a food blog so I will save my kvetching for Trip Advisor, but the short version is — nice enough hotel in a nickel-and-diming kind of way, but the management stinks. Won’t honor the actual reservation we made with Delta Vacation, which I have in writing, because it doesn’t click with what their local agent says we paid for. It would cost them nothing to honor it but it is the principle, the manager says. Fine. I can stand on principle too, and will when I make my next reservation in Israel. Which I will, because I love this place already. That I do is in no small part due to our guide, Amir Gadnaor. We really just lucked into him — he works with a guide that took a friend around last summer — but he suits us exactly. Bearded, in jeans and sandals, he is laid back, flexible, knowledgeable, and interesting. He’s in his early fifties, grew up in Tel Aviv, lives with his family in the desert now, where he finds a kind of solace I don’t understand but that he promises to show us. The itinerary he has planned takes us all over the country. I said we wanted to focus on politics and food and so far that’s what we’ve gotten. Fascinating. And delicious. So. 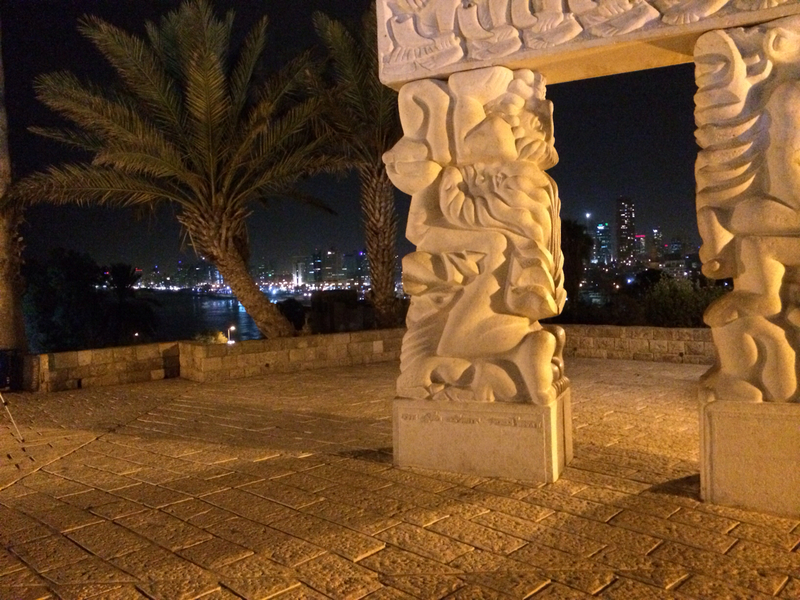 Last night Amir met us at the hotel and suggested a walk along the shore to Jaffa — not far away — with a tour of the old port city and dinner by the water. It was balmy and breezy and we walked right along the beach on a concrete boardwalk structure, listening to waves and imagining centuries of pilgrims arriving on these shores to make the trek to their holy places. It was lovely to see Jaffa at night. An old Arab city, many of the buildings are now trendy night clubs or artist hangouts. But there is still a working waterfront and we had a superb dinner at The Fisherman’s Restaurant. 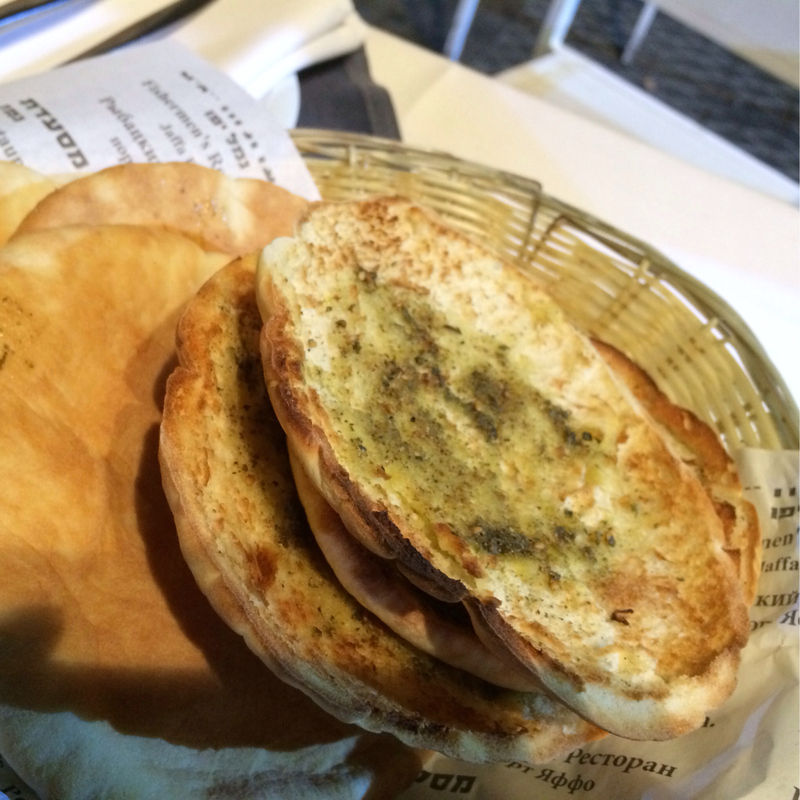 Bread and za’atar is special for me — one of the tastes that summons my dad. Shut my eyes as I savored it and there he was, Saturday noontimes, recreating the snack of his own youth, taught him by his dad. Three generations of Lebanese food memories, untethered to any real knowledge of the country (Grandpa was one when he left), but there you are. Food is a powerful part of our heart’s geography. 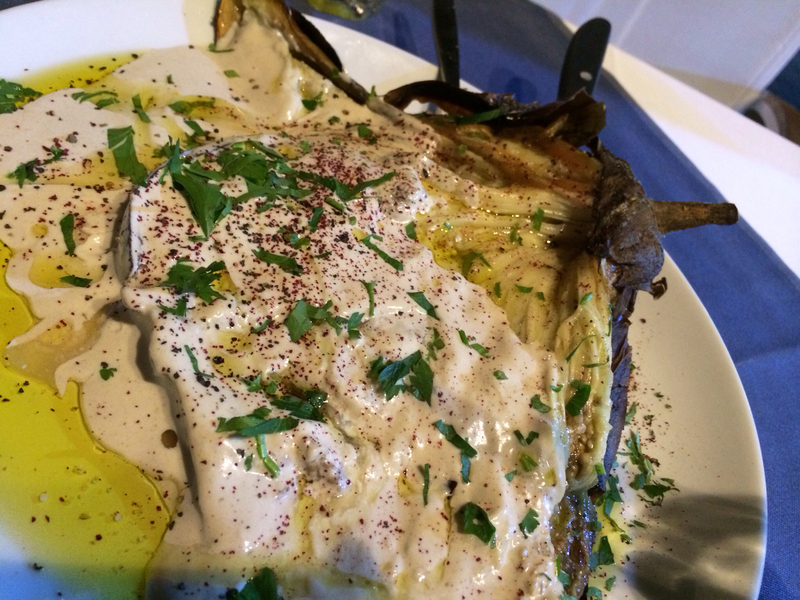 The star of dinner, for me, was the grilled haloumi cheese — love that stuff — and a grilled eggplant, smoky and just slightly bitter, dressed with tahini. Yum. Also had an Arabic salad — diced up and dressed vegetables. 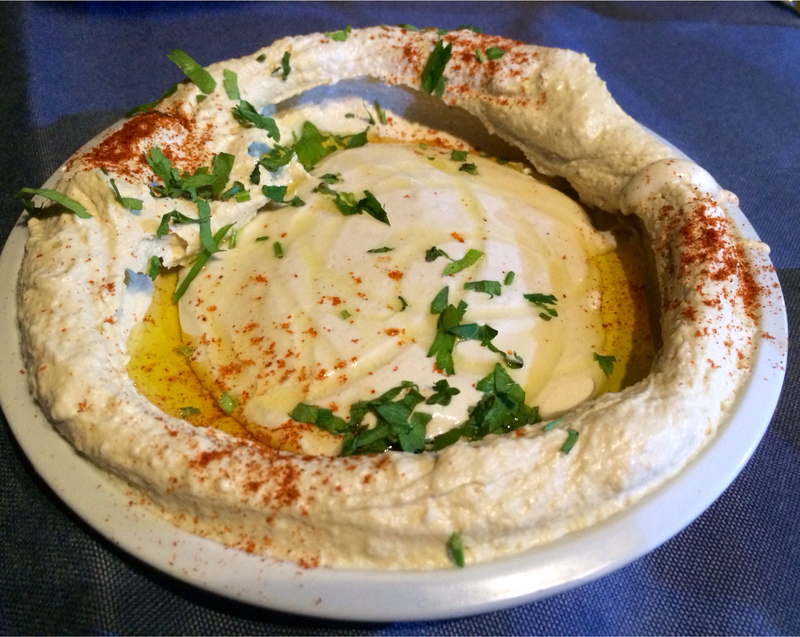 Very refreshing and and a good tart contrast to all the tahini-ness of the other starters. And those WERE just the starters. We also had a seafood platter to share. Small fish, grilled whole, sweet and tasty. 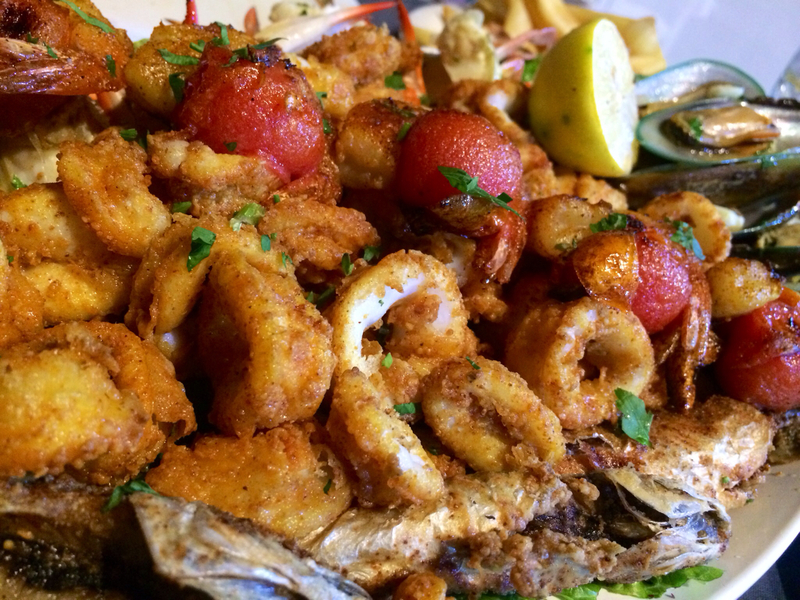 Fried calamari, tender and succulent, grilled shrimp, cracked crabs, and some mussels in the prettiest luminous greeny shells. We sat, picked at the seafood, talked about the history and politics of the region, and watched fish jump and feed in the harbor. For a food and politics junkie, it could not have been a better evening. Bittersweet, because my mom is very ill and my sister texted me some not-good news while we were out, but lovely too. This morning I am looking across the blue Mediterranean, on a sunny day that promises to get to 90. We pick up the car at 9:00 and Amir has a day planned that starts with a glimpse of Gaza and ends with dinner with a Druze family in a cave. I will report back. So glad I am here. sounds great– you ae off to a terrific vacay! enjoy it all!